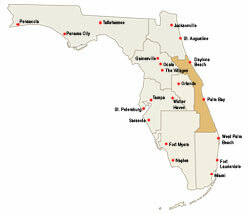 The Florida Space Coast is a popular retirement area in the United States today. With a warm climate and activities for any age, whether your a Grandparent or a Grandchild. With everything from Nascar® in Daytona Beach, to Golf at any of our championship golf courses, water skiing, and lake and deep sea fishing just to name a few. If your looking for year round fun in an adult retirement community, then Florida retirement is for you. Take a look at some of the many adult retirement communities that Florida has to offer below. Click on each community to see what they can provide, to help you enjoy your retirement here in Florida. Recreation: Residents enjoy jogging, walking, biking, 6 Shuffleboard courts, 2 horseshoe pits, and recreational fishing in lakes stocked with bass, speckled perch, tilapia and catfish. Colony Hall: A community performing arts facility and multi-purpose activities center is used for choral and theater events, banquets, celebrations, dancing, social parties, bridge games or other club meetings. The facility features full kitchen facilities, a lending library and is a/v equipped. Restricted 55 Plus: Members comprise a very active, caring and friendly community. Twenty percent of members may be any age above 21 years. Indian River Colony Club is an active 55+ community offering residents a friendly, relaxed, and casual lifestyle with individually owned homes and all the conveniences of maintenance free living – all at affordable prices! Located in sunny Viera (North Melbourne), Florida, just minutes away from great beaches, upscale shopping, medical facilities, performing arts centers and Patrick AFB. The Indian River Colony Club is part of "The Space Coast," making it an ideal retirement community for those who want an active lifestyle. Tennis: Offers four newly refurbished Har-Tru courts with year 'round professional teaching staff for the community residents. This prestigious equity club where acres outnumber residences by nearly 2 to 1, is directly located on the scenic coast-to-coast St. Lucie waterway and only 30 minutes from Palm Beach International airport and all the amenities of the Palm Beaches. Piper's Landing offers a maximum density of 302 homes on 585 acres, featuring a particularly well-groomed golf course and twenty-six lakes brimming with bass, a perfect retirement community for when your ready to retire. With approximately 2 acres per resident, Piper's Landing will forever remain uncrowded and unspoiled.